Throw the most gorgeous Moana themed birthday party with hawaiian plumeria flowers and create memorable flower headband party favors. Have friends and family show off with vivid iridescent flower leis that add a fun and exotic element to your party attire. Make your guests feel like they're in paradise and always have them in your luau party supplies. They also make great luau party favors. Be the loveliest lady at the luau when you embrace one of these flower hair accessories! Perk up your celebration look by let your hair down, make it into a flower barrette, add the plumeria flowers, pinning them and let loose! NOTICE: The "Super Z Outlet" seller is the only authorized seller, we do not sell wholesale so there should be NO other sellers; Any other sellers are illegally selling their own products using our registered Trademarked company name. In this listing, purchasing from any seller other than "Super Z Outlet" will result in a potentially faulty product that may be unsafe and cause injury. Please be sure to purchase this product from the "Super Z Outlet" seller to avoid any problems with your product and to ensure both your safety and satisfaction. Manufacturer's warranty included only when purchased from Super Z Outlet. PRODUCT DETAILS Necklaces: solid color (blue, white, yellow, red, pink, orange, and green), and mixed color (purple and white, blue and white, pink and white, green and white, red and yellow). Each necklace has about 25 flowers and each flower measures 2.4 inches long. Hairpins: pink, dark purple, purple, yellow, orange, sky blue, coffee, red, white, green. All the flowers are made with soft and odorless fabrics (polyester for leis and EVA for hairpins) for safety reasons. All Purpose: Mix and match different leis and hairpins with your outfit! These silky and soft colorful leis can be worn in different styles: as a necklace, a bracelet, or a headband. 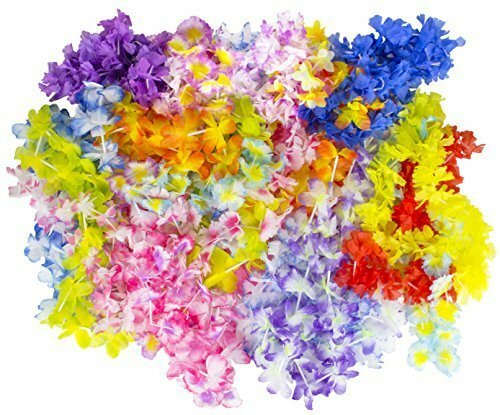 Guests can pick their favorite style and enjoy the summer beach pleasure with these colorful flower leis and hairpin clips.These party accessories are also great on many occasions: birthday parties, graduation celebrations, barbeques, raves, holidays, etc. Decorative: Make your kid's next birthday party epic. 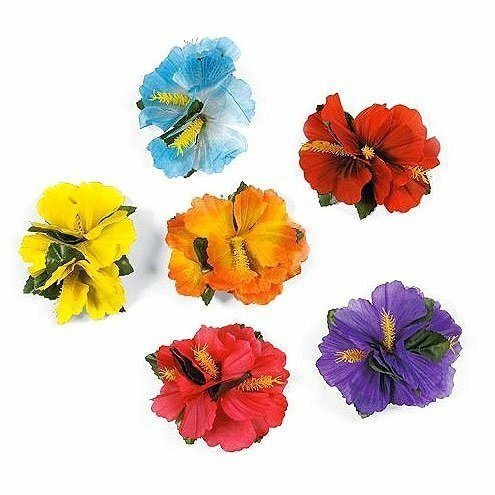 Decorate your house with these colorful flower necklaces and let girls pick their favorite hairpins! Simple but colorful designs can bring you the summer beach breeze vibe! RECOMMENDATION: Do not keep the small parts of the toy in mouth in case your child swallows it. WARNING: CHOKING HAZARD. Recommended for children 3+. 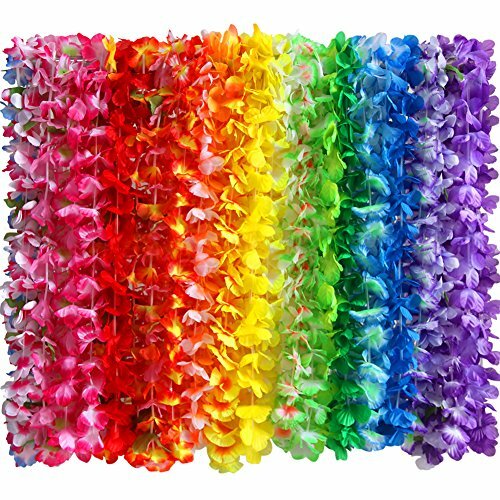 Whether Your boarding At JFK For A Long Flight To Maui Or The Big Island Of Hawaii Or Whether You Are Having A Tropical Luau Hawaiian Party Event, Our 12 Pack Of Polyester Mahalo Leis Are For You. 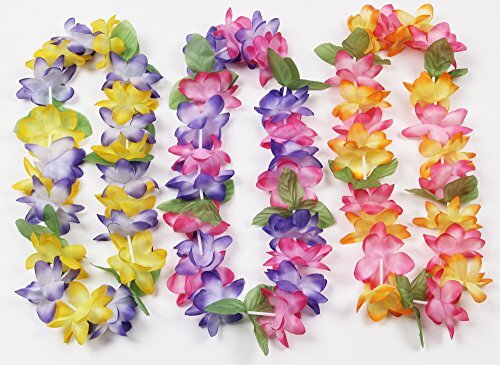 Flower Leis Perfect For Luau Themed Parties, Summer Blasts Or Beach Wear. Perfect For Luau Themed Birthday Parties Or Any Luau Event. 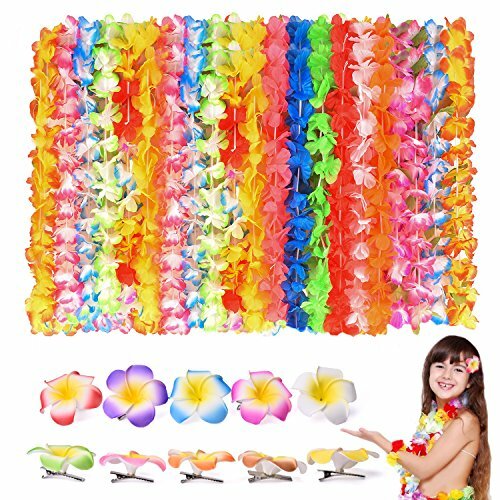 Great for A Luau Costume; Great Luau Decorations. 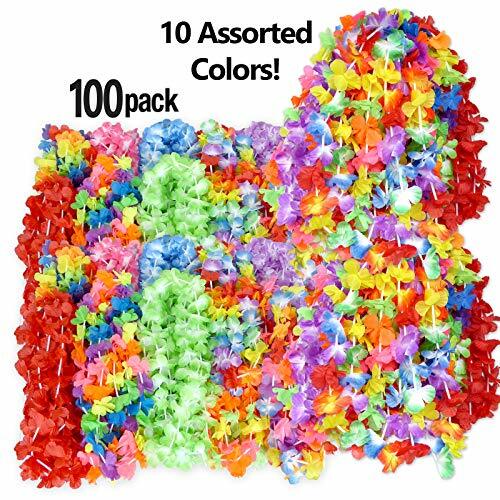 If You Need Hawaiian Luau Party Decorations, Look No Further than Oojami's 12 Pack Of Polyester MahaloLeis. NOTICE: The "Oojami" seller is the only authorized seller, we do not sell wholesale so there should be NO other sellers; Any other sellers are illegally selling their own products using our registered Trademarked company name. In this listing, purchasing from any seller other than "Oojami" will result in a potentially faulty product that may be unsafe and cause injury. Please be sure to purchase this product from the "Oojami" seller to avoid any problems with your product and to ensure both your safety and satisfaction. Hawaiian Tropical Island Necklace: These colorful simulated silk flower necklaces are the perfect accessory for your next island themed event! Comfortable and Soft: These simulated silk Leis are light and soft making it comfortable to wear all day long. Bright and Colorful: Each pack includes a variety of bright and colorful necklaces helping create a tropical island theme. 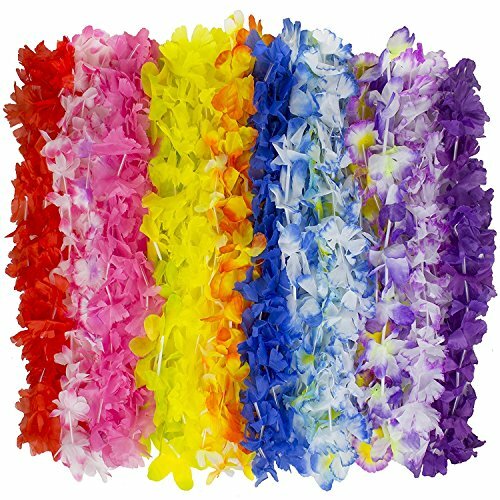 One Size fits Most: Leis measure approximately 38" in diameter, perfect for both adults and children. Satisfaction Guaranteed: If for whatever reason your not happy with your purchase, feel free to return it for a refund. 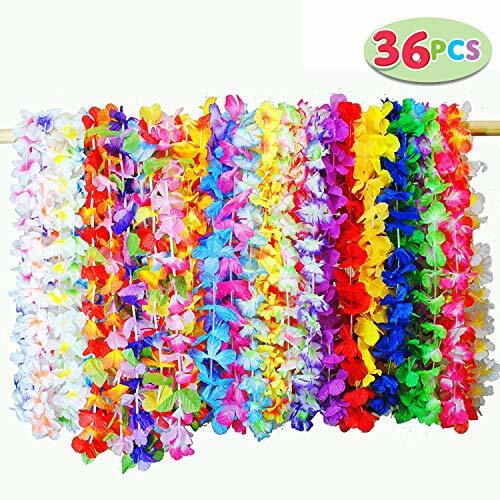 LOT OF 3 108" JUMBO FLOWER LEI GARLAND TOTAL 27 FEET LUAU BEACH POOL PARTY!! LEI AS BRIXLIE SA PBB OTSOYAWAN PARTY LAUGHTRIP TO!